I have been feeling rather guilty knitting things for myself instead of my loved ones. However, I find it difficult to find patterns that I really like for boys, so that is mainly my excuse. When one day, browsing Ravelry again (I have to tell you about my passion for Ravelry!) I came across this pattern, called Five Fruits by Amanda Kerr, available as a free Ravelry download. 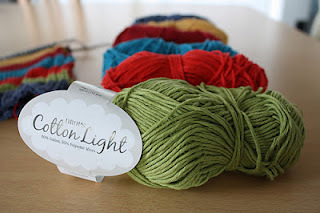 I had used this yarn before, but since it has changed composition, so I was still excited to wait for it. I was delighted by the colours when they arrived, but the yarn felt thinner and less soft than the previous balls I had in my hands. Here we go. I'm blogging. Who knew. I have to admit, to the world and to myself, that I am an addict. I am addicted to yarn, needles, knitting, crocheting and everything that comes with it. I am addicted to Ravelry. I am addicted to some beautiful blogs I have discovered over the past year. And, who knows, maybe I'll become addicted to blogging. I've been playing with the idea for a while now, so here goes nothing. I will try to share with you all some of the crafty and yummy stuff going on in my life. As I have already done many many projects before this blog, I will think of a way of sharing these with you as well. Now, I am off to read some more blogs for inspiration ;) and start knitting again!